It’s been a long while since I’ve posted a free monogram for hand embroidery! I’m determined to finish up this Celtic alphabet, though… so here’s the J.
You’ll find suggestions for embroidering these monograms under the Celtic A. You’ll also notice, on the Celtic A, that the area inside the loops formed by the knots are seeded with little dots. To cut down on the time spent cleaning up the monograms, I skipped the dots, but you can certainly add them into your embroidery, using seed stitch or French knots, if you wish! For more monograms – in this alphabet and one other floral alphabet – please visit my Index of Monograms for Hand Embroidery. 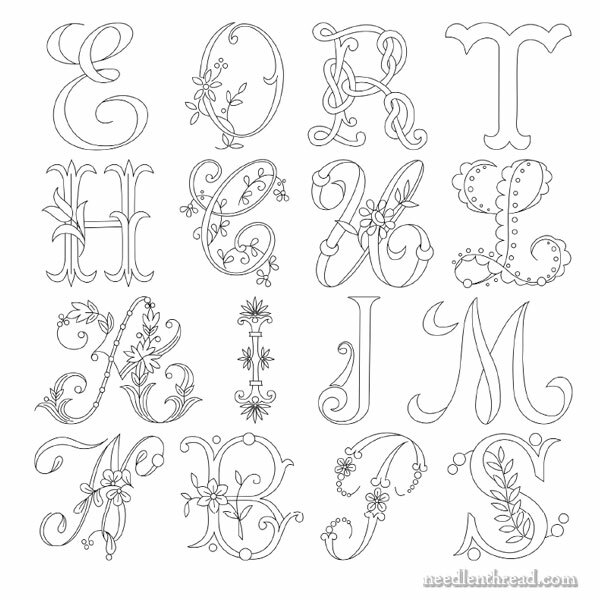 You’ll also find a bunch of free embroidery patterns here on Needle ‘n Thread under my Index of Hand Embroidery Patterns. Hi Mary, thank you for another monogram. I have been sorting out my files of patterns that I pull out of magazines, and I found a lovely alphabet. I will scan and send to you later this week. How is the video for Turkey Work coming?? I know you caught a cold and were not able to do the voiceoverat the time. The turkey work video is sitting here, waiting for editing and voice. I’m debating over it. I don’t like the video itself – the lighting is bad and the stitch itself is sparce and ugly (I only worked two lines, with the stitches rather large, so the motion of the stitch can be seen). I need to revisit the video and see what I can do with it. I’ve had really poor luck with filming lately. I think I’m expecting more now. I look back at some of the earlier videos and cringe at their quality! Anyway, I’ll get back to it soon. If nothing else, I could just take this raw one and convert it to something that’ll play on quicktime or windows media and send it to you, so you can get the gist of the stitch. I’ll see what I can do! Hi Mary, please dont worry about the quality of the older videos, I was able to follow the instructions and see how things are supposed to be done quite well. Thanks for attempting the turkey work, I look forward to seeing it.